Performance Now charts the development of performance by visual artists across six continents since the turn of the 21st century. It reveals how live art, so integral to the history of art in the 20th century, has become an increasingly essential vehicle for communicating ideas across the globe in the new millennium. Renowned authority RoseLee Goldberg discusses the key themes in performance art practice, from beauty, global citizenship and political activism to performance's intersection with film and technology, dance, theatre and architecture. Each chapter is followed by illustrated profiles of the world's best-known performance artists, accompanied by extended captions that assess the importance of specific works to the practice of international performance art. The book concludes with an extensive reference section. 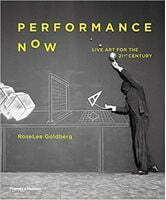 Providing a visually exciting and stimulating overview of this most varied art form, Performance Now is the go-to reference for artists, art students and historians as well as avant-garde theatre and movie goers.